One of the staple dishes in the south is fried green tomatoes. 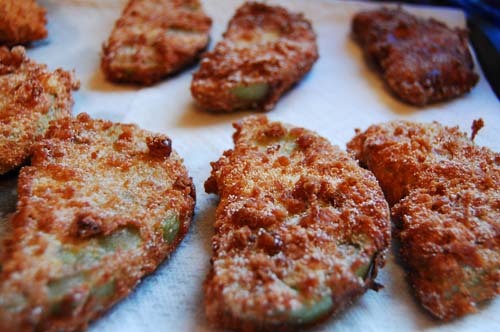 I love fried green tomatoes because they’re so adaptable. I know I’m always saying that, but I really appreciate that quality in a food. They’re good as appetizers, in salads and sandwiches, and even dressed up for dessert! I tend to like my fried green tomatoes on the spicy side. The cornmeal and flour can be really bland if you don’t jazz it up, so I add a lot of heat and it comes out about medium intensity. I like to add paprika, red pepper flakes, cayenne, chili powder, and maybe a little chipotle if I’m feeling crazy. 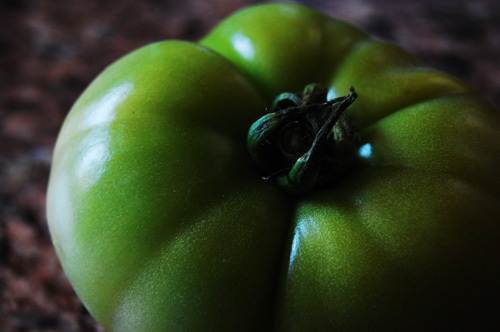 Fried green tomatoes are made in a three step process. 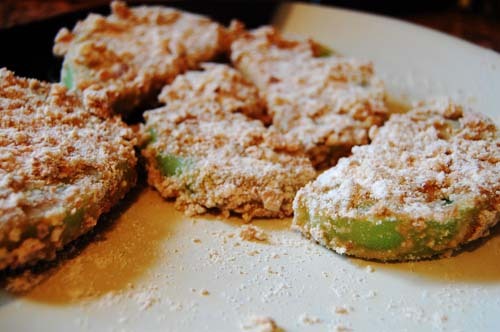 First, they’re dipped in a mixture of flour and spices. Second, they’re dipped in egg. Finally, they’re dipped in a cornmeal mixture with more spices. Dipping them in egg between the two dry dips gives them a nice crunch. Then they’re fried, blotted off, and enjoyed! Mix together flour and half the spices. In another bowl mix together the cornmeal and the rest of the spices. In a final bowl whisk the egg. Heat the oil in the pan. When it’s 350 degrees, or when bubbles form at the base of a wooden spoon, it’s time to cook. Dip the tomato slices first in the flour mix, next in the egg, and finally in the cornmeal. Drop in the pan and fry until golden brown. Remove from the pan and place on a paper towel so the oil blots off. I made these tonight! The only thing I added besides what you listed was Tony’s Creole Seasoning. They were amazing!